Building cycling infrastructure is often touted as an expensive thing to do, but this would mainly apply to street retrofits where a significant part of the costs are sunk into undoing layouts which were designed for motor traffic. This does apply to walking infrastructure, although probably not to the same degree because most people walk and don't give footways and crossings a second thought. This is very broad, is subject to wide variation and depends on all three being built together. If a footway and a cycle track is built next to a carriageway, then the assumption will be that the costs are lower because they will benefit from carriageway drainage and lighting, whereas with a standalone footway and/ or cycle track, some of the costs go up a bit because of drainage and lighting. It's also down to the structural design. Carriageways need to carry motor traffic whereas cycle tracks and footways don't, although in the Design Manual for Roads & Bridges, there is recognition that they sometimes take motor traffic (usually over-run). In other words, a cycle track which can in theory be mounted by a delivery truck, needs to take this into account (whether or not people should be parking a truck on it). If the design doesn't appropriately take this into account, even the over-run by a single HGV could actually cause damage. 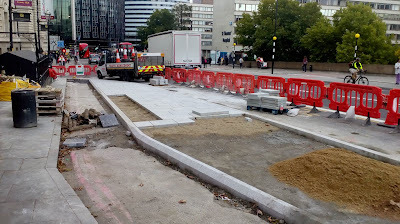 The photograph shows a cycle track which cunningly doubles up as a fire path. If it wasn't built to take occasional over-run by a fire engine (which could be full of water and so very heavy), then the first time it is used, damage could result. The photo below shows the same scheme being built, demonstrating some serious thicknesses of material going in. The other issues is that of frost. In the UK, we often have soft soils such as silts where the first half a metre could be damaged by freezing temperatures. We also have clays which can shrink and expand in dry and wet weather. We will always be building on the underlying soils and while the structural requirement for a footway or cycle track won't normally need to be too thick, the condition of the underlying soil might require us to dig more out from below. The point I am making is that building footways and cycle tracks require the same level of technical know how and site information as we would with a carriageway. Where we are not building across a field, then we are definitely into reworking what we have. One useful principle is that it is easier to convert a carriageway into a cycle track or footway than the other way round. The main reason for this is utilities. 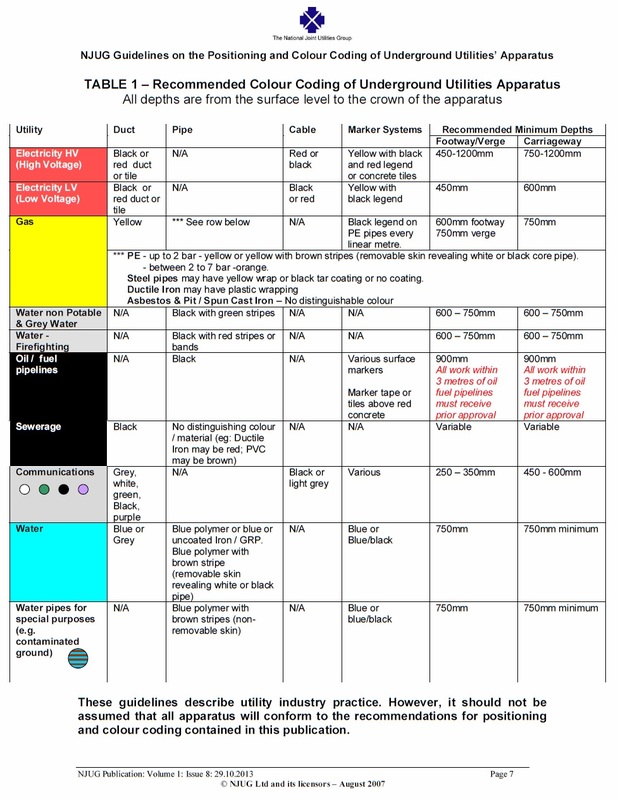 The table above is from some industry guidance on the depths utilities should be laid - the full document can be downloaded here. Have a look at the last two columns which give depths within footways and carriageways. A cycle track would generally be treated as a footway in this case. Some utilities are the same depth, such as water which has to be out of the way of frost. Others have a different depth on the basis that those under a carriageway need protecting from traffic loading. Telecommunications kit is one which can be a massive pain to deal with because there is so much of it and we have the differential depth. I'm often dealing with developers who need to build a new junction or access across a footway where a carriageway construction is needed and all of the utilities are too shallow. If there is optical fibre, then best you have plenty of space for zeros in the amount box of your cheque book. The other thing to consider with a scheme is that getting utilities diverted away from your scheme or lowered within your scheme is that it can take ages. On an important road or street, any work that will take over ten working days will generally need a 3 month notification period before it can start. This is to give proper notice to the utilities or others who might have works which need coordination (and could be a blog post in its own right). Street lighting is a classic item that takes ages to shift because of the need to disconnect, shift and reconnect. Traditionally the power works are undertaken by the power company and the column works by the local authority, but thankfully we now have contractors who are permitted to do both which makes coordination a bit easier. The photograph above shows a trench being cut into the carriageway for a new kerb line for the interface between a cycle track and narrowed carriageway. This generally doesn't affect utilities (unless a chamber is in the way) and as the levels are being raised, we won't have to think about lowering utilities. In the situation where we have a very wide footway and we are taking some of it for a cycle track, even building a stepped cycle track (the cycle track lower than the footway, but higher than the carriageway) may reduce the cover to utilities enough for them needing lowering. The photo above shows the southern side of Vauxhall Bridge in London. The footway and cycle track are at the same level (with a tactile kerb between) because the cycle track has half come from the carriageway and half from a wide footway. Dropping the footway half to carriageway level here would probably have had an impact on utilities. Further north, the cycle track as at carriageway level because the cycle track fully takes space from the carriageway. The pair of photographs above are on the western side of Westminster Bridge in London. They are actually showing two different bus stops (one after another), but again, the cycling space and floating bus stop comes from the carriageway and so the cycle track can be kept at carriageway level. Part of the work included resurfacing the main carriageway after the works and a rebuild of the central reservation, neither of which were required for the cycle track. In the event of someone looking at the project costs from a criticism of investing in cycling point of view, all of these costs will be lumped in and so this really can skew how people see the costs of just providing for cycling. In my view, renewing the whole street is often a good idea from a maintenance point of view, but we need to be honest about where the costs are apportioned. The other piece of street kit to talk about is that of traffic signals. Costs vary with site of course, but replacing the equipment on a simple 4-way signalised junction might cost around £60k. Installing the same kit first time at the same junction might cost over double that because of the ducting, installing tactile paving and possibly moving lighting or other utilities round. What we should remember with traffic signals is that the are there in order to manage the dominant flow of motor traffic. They give drivers coming from side roads a chance to get on the main road, or they protect people walking and cycling. The photo above shows the junction of Ruckholt Road and Orient Way in Waltham Forest. Without the traffic signals, nobody cycling is going to have a fun time trying to get across the main road. The signals are not there because a cycling scheme was built per se, they are there because of the motor traffic and so the investment in the scheme is skewed towards dealing with motor traffic. Finally, lets compare the costs of a zebra crossing over a carriageway and a cycle track. The first is perhaps £15k+ and the second is perhaps £5k. They will both have tactile paving and dropped kerbs in common, but the cycle track doesn't have to have Belisha beacons and it doesn't need high grip road surfacing to help speeding drivers slow down. Again, the extra cost is because of the motorised traffic and skews the budgets accordingly. So, despite what some people might have you believe, building for walking and cycling is cheap, it's just that at the same time we have to blow a load of cash to accommodate motor traffic in doing so. Adventures in time & space of a cycling, walking, highway engineering, Chartered Civil Engineer. The street is not too narrow, your imagination is too narrow. 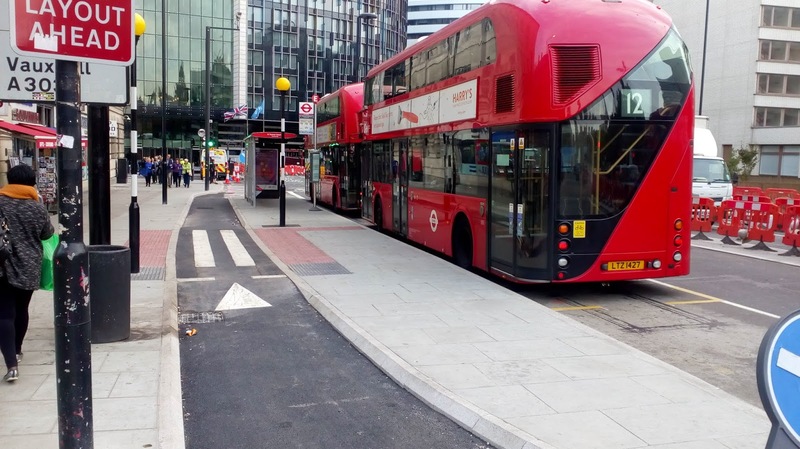 This blog gives my thoughts on transport and highways in London and the UK, with a bias towards walking and cycling, which are the resilient transport modes which will civilise our towns, cities and neighbourhoods. Vision Zero needs Leadership, Transparency and Accountability Mr. Mayor! Human Streets – …. It's about the kind of city we want to live in. This blog is me expressing my opinion. Any links are given for background and for information and I am not responsible for their content. Some of the things within this blog could be interpreted as design work for the purposes of the Construction (Design & Management) Regulations 2015. This is not my intention, such items are not guidance, simply ideas. For any design work you should be suitably competent or engage someone suitably competent to advise you. Don't take my word for it, do some research and challenge "them" as "they" don't always know what "they" are doing! I do use images from different sources which I try to acknowledge, but if I have used your image and you are not happy, please let me know and I will remove. All other images are mine and I am happy for you to use them non-commercially with an acknowledgement. I am not writing on behalf of any organisation, the views expressed in this blog are my own and not those of my employer or any organisations that I am a member of or affiliated to.